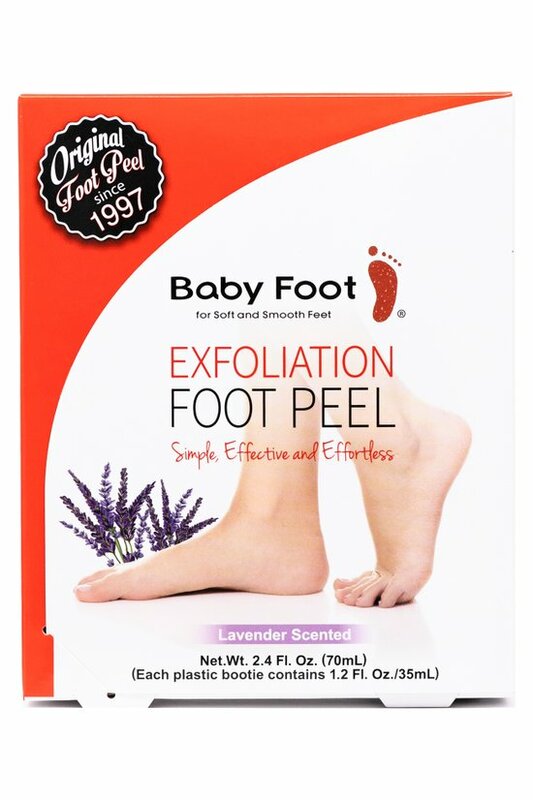 Baby Foot is an innovative foot care product with a unique formula of 17 types of natural extracts that allow your feet to exfoliate naturally, leaving them highly moisturized. Wear the booties for one hour, then rinse feet and within a 3-7 days, natural exfoliation will occurr. Peeling can last up to 2 weeks, but the baby soft feel will last for weeks! Remove booties from packaging. Cut along dotted line. Put foot in bootie & secure with tape. Wait one hour. Wash the gel away. See carton for full instructions. Dead skin will start to peel 3-7 days after initial application. Depending on the person, peeling can last up to 2 weeks. Nothing is softer than baby's feet. The remarkable Baby Foot® collection of peels and masks restores your soles to the natural, caressable softness of your first years. 16 natural extracts and fruit acids (alpha hydroxy acids) smooth dry, cracked feet by gently peeling away the rough, dead outer layers and leaving nothing but moisturized, soft soles. So easy with zero discomfort.